Upon arrival in Marrakech you will transferred from the airport to the hotel and after your rest you will spending the day for visiting Marrakech, which is the ancient Imperial City. You will discover the majesty of the Koutoubia landmark which is visible from all over the city, built in the twelfth century, and it is a reference model for the tower of the Giralda Tower in Seville and the Hassan II Tower in Rabat, the Saadian Tombs. Then you will visit the Bahia palace and the mausoleum of the Ba Ahmed vizier. After that you will take your lunch. Then we continue through the Jemaa el Fna, that is the living heart of the city, and through the Souk of the dyers, and the leather zone and then we pass through the spice zone. The Dinner and night will be at the riad. After breakfast, you will have a departure to Ouarzazate via the Tizi-n-Tichka pass and the High Atlas Mountains, your lunch will be along the way PalisTichka. After lunch departure for visiting the Kasbah of Ait Ben Haddou (nominated UNESCO universal heritage). 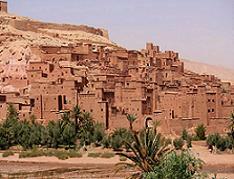 We will have a visit of the Kasbah and the fortified village and a visit of the studios before arriving in Ouarzazate. Dinner and overnight will be in hotel (Half Board). Departure at 7h30 from Ouarzazate to the Kasbah of storks and panoramic tour of the lake, continuing to Agdz (we stop at Agdz for a short stop) through the Tizi-n-Tinififft Mountain to take the trail that goes to the Alkaid Ali Tamnougale Kasbah. The lunch at a restaurant, after lunch we continue through the track passing through the Draa Valley, where we stop for a leisurely stroll through the palm trees and Ksour to Zagora. We will arrive at the end of the day in Zagora. Dinner and overnight will be in Zagora in a beautiful riad. From Zagora we will have a departure through the Draa valley to reach a path leading to the villages of Ait Taftechna and Ouaazique with its rock caves. Along the road we come to Tazarine El Alnif where we have lunch. 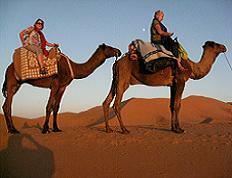 Then we continue towards the impressive dunes of Merzouga (Erg Chebbi) through Rissani. We pass from the 4x4 to the dromedaries and watch the different colors of the sun on the dunes and spend the night in the heart of the dunes. Dinner and overnight will be at the camp in a Berber tent. After we wake up in the morning to watch the sunrise on the large dunes, we get back on our camels or on foot across the dunes. After breakfast, we take the path leading toward the town of Erfoud. Then we cross the Tourog palm grove, and the Tinjdad grove (lunch on site) and after lunch we continue towards the Toudra Gorges where we spend the night. Dinner and night will be at the riad. After breakfast and a walk through the palm groves we depart to Tinghir Boumalne to continue through the Dades Gorges, we visit the Gorges and have lunch nearby, then we return via the Dades Valley to the Ait Youl Kasbah and take a trail through the Valley of Roses and that leads to the capital of roses Kalaa M'gouna; we continue to Skoura and visit the Amredhyle Kasbah in Skoura. 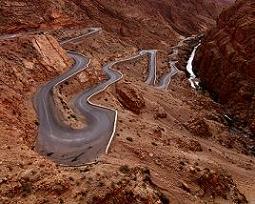 Then we proceed to Ouarzazate. Dinner and overnight will be at the riad. After breakfast departure to visit the city of Ouarzazate: Taourirt Kasbah, film studios, Ait Ben Haddou Kasbah. We pass through the villages Merzgane and Ighrem. You will have lunch on site. 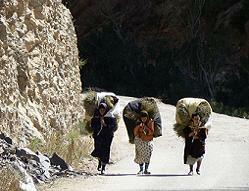 We proceed to Marrakech via the paved road that crosses the Tizi-n-Tichca pass. Then we will arrive to Marrakech, after dinner we will spend the night in riad.